The custom ticket offices are fantastic to promote your event and show. We can vinyl wrap the unit to your specifications and design. We can provide you with the dimensions and some ideas, to collaborate together to create a show stopping customised toilet trailer or ticket booth! 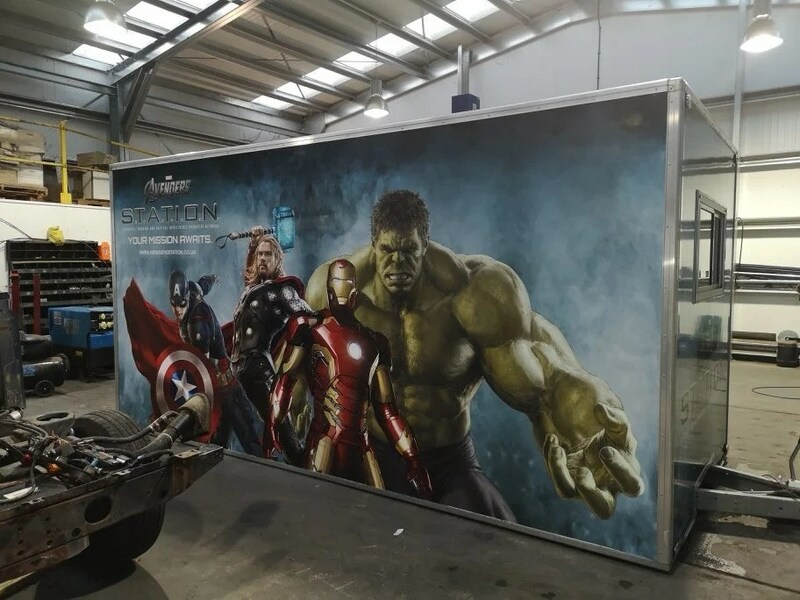 Personalising the wrap on one of our ticket booth or toilet trailers is an excellent way to ensure your branding or theme is consistent across your event. Having a bespoke wrap not only guarantees visual consistency but also promotes the brand, maximises attendee engagement and adds a unique and personal touch to your event that couldn’t be achieved with a standard unit. 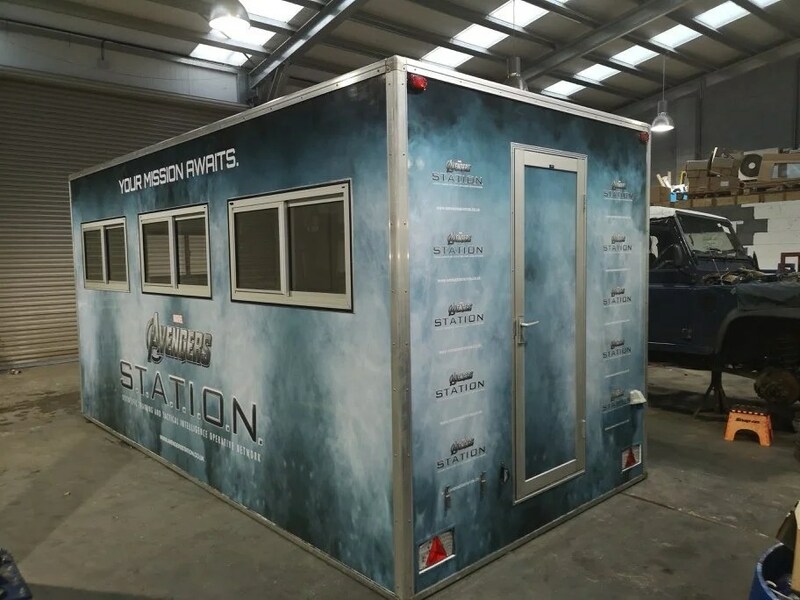 Here we have an example of our bespoke wrapping of our ticket booth for Avengers S.T.A.T.I.O.N. London. 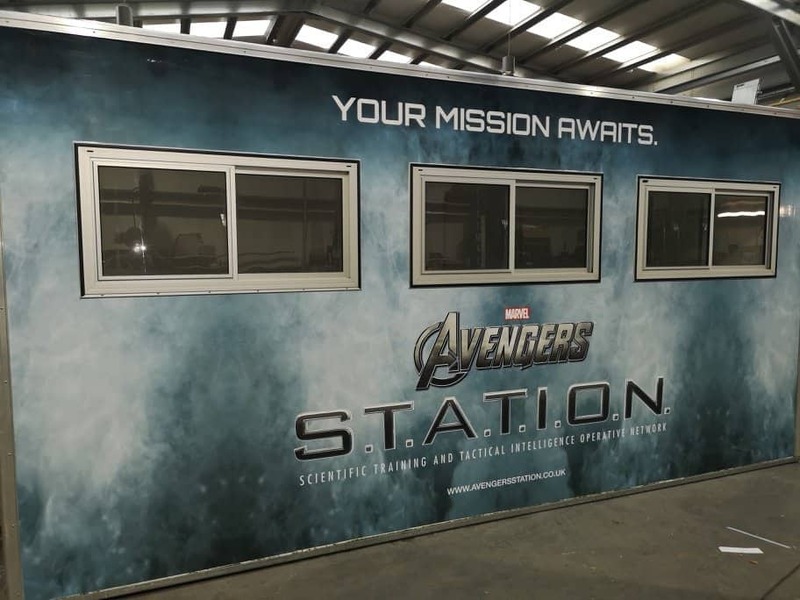 A highly anticipated multi-room experience offers fans of all ages the opportunity to delve into the super-workings and back-story of each of The Avengers as they train to become an agent of the Station. The wrapping can also be used to display useful information such as artist line ups, opening and closing time, stage information and ticket prices as well as to promote the headliners to generate more attention. We recently had a ticket booth wrapped for Greenwich Music Time Festival. Our most popular unit to wrap is our 16ft ticket booth as they are perfect for large functions, especially for managing crowd control and offering a professional and visually appealing point of reference. The unit can be used at the entrance, exit or other key locations within your event and come equipped with power sockets which can be used for items such a tills. In addition there is strip lighting and a heater to ensure that it is a a pleasant working environment for those inside. Customise Your Toilet Trailer or Ticket Booth! The wheeled booths can be towed onto site, which is significantly cheaper than using a HIAB delivery. Once in place, the unit can be lowered to the ground using a hand held drill. A 13 amp power supply is required for the running of power throughout the unit. Suggested purposes for ticket booth hire are airshows, golf championships, music festivals, major horse shows and Christmas events. They could also be used as a merchandising stall when selling branded or event related goods. Other potential uses are as security posts, gate houses, car park kiosks, checkpoints and toll booths. The units can also make effective information points for your event attendees. If you are interested in Customise Your Toilet Trailer or Ticket Booth, please do not hesitate to get in contact by calling our friendly event sales team on 0800 371 994. Alternatively, you can email us on event@site-equip.co.uk or fill out an enquiry form below. We will get back to you as soon as possible!